We think anyone can look good, it’s just a matter of finding the right style. And having an expert at hand who tells you yours. 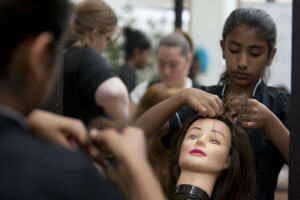 That’s why at Studio E12 we offer accredited courses that are all about employability skills, beauty, make-up and hair. Our courses are aimed at mixed male/female groups, aged between 13 and 19 years old. And we don’t just stick to the foundation – we scrub up and get down and dirty with cleansers, creams, shampoos and hair extensions. We cover areas like identifying the right beauty products and their usage, manicures & nail art, health & beauty theory, head massages and styling techniques. And more. The sessions at Studio E12 take between 3 and 5 hours, and over time the young people get credits towards a number of qualifications.